How to recovery a Microsoft Outlook pst file? If you need to recovery a pst file, you can use the Outlook Recovery Toolbox (download) tool. This program was created especially for recovering information from damaged pst files of Microsoft Outlook. If the Outlook mail client can't open a pst file, you should recovery the pst file using a special tool. For example, Outlook Recovery Toolbox - recovery pst tool. The characteristic feature of this program is that it does not perform direct recovery of a pst file. 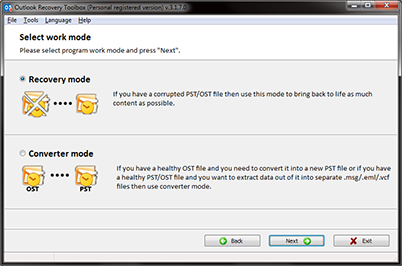 The program does not modify or delete the pst file you want to recovery. The program first scans the file and shows the user all messages, contacts, etc. it has found in the file. After that, the user can save this data to a new pst file. This method of recovering pst files is safer and leaves the source pst file unmodified. The program can recovery pst files larger than 2 Gb, the maximum size of a pst file that can be recovered is 4 Tb. The program can recovery pst files of all versions of Outlook (Outlook 97, Outlook 98, Outlook 2000, Outlook XP, Outlook 2002, Outlook 2003), but the recovered data can be saved only in Outlook 98 or higher. Besides recovering a pst file, the program can export messages from a pst file to separate eml files. 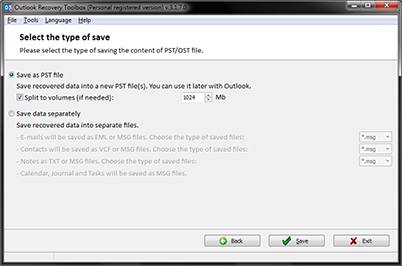 Messages saved in eml files you can then export to other mail programs like Outlook Express. Outlook Recovery Toolbox can recovery PST and OST files too.